Dickey completely deserved this award. He was consistent all year going 20-6 with a 2.73 ERA with 230 strikeouts. Although he was not on the best team, he made the most of what he had. What makes this year extra special for Dickey is the fact that it was such a surprise. The knuckleballer came off a year in which he went 8-13. He did have a 3.28 ERA which is very good, but to win 12 more games and lose seven less than the year before is phenomenal. Dickey had some competition, but in the end it was not close. Gio Gonzalez finished in third place with 93 points (behind Clayton Kershaw with 96 points—I will get to him). Gonzalez went 21-8 this season with a 2.89 ERA and 207 strikeouts. These numbers are good, but Dickey edges him out in every category besides wins. The only slight advantage that Gonzalez could have had on Dickey was the fact that he played for a contender. Gonzalez was supported by strong pitching in Jordan Zimmermann and Stephen Strasburg, so the two other aces could have taken away a bit. Finishing second was Kershaw. Kershaw could not defend his title from last year, but put up a strong fight. He went 14-9 with a 2.53 ERA and 229 strikeouts. If Kershaw could have gotten a few more wins, we might have seen a different outcome. 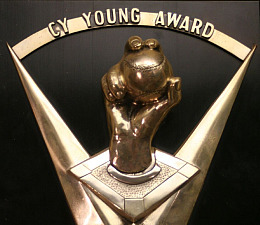 But, Dickey was too strong and deservedly gets the 2012 NL Cy Young. Wow. What a tight race. Price ended up prevailing over Verlander mainly because, in my opinion, he lead the league in wins (20) and ERA (2.56). Unlike the National League, the American league had three very strong candidates in Price, Verlander, and Jered Weaver. In the end it came down to Price and Verlander. Weaver had a great year and had the same record as Price (20-5), but fell out of the race with his amount of innings pitched. Price and Verlander both had over 200 innings pitched (211 and 238.1 respectively) while Weaver had only 188.2. Price and Verlander both had the same amount of quality starts (25), but Price edged Verlander out in every other category besides strikeouts (Verlander had 239 while Price had 205). Both pitchers were very reliable and valuable to their team, and whoever won really came down to the flip of a coin in my mind. Price had 14 first place votes to Verlander’s 13, and each pitcher had 13 second place votes. Verlander was on a contender, but some could say that he was supported by a much more powerful lineup with the Triple Crown winner in Miguel Cabrera and huge offseason signing Prince Fielder. Fernando Rodney actually received a first place vote from Drew Davidson of the Fort Worth Star Telegram. 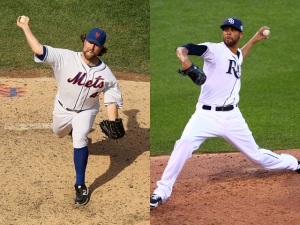 Personally, I don’t think relievers should win the Cy Young. As important as they are, they only pitch a fraction of what starters do. This Cy Young will probably be the first of many for the young Price. Please e-mail us at: mlbeports@gmail.com with any questions and feedback. You can follow us on Twitter and become a fan on Facebook . To subscribe to our website and have the daily Reports sent directly to your inbox , click here and follow the link at the top of our homepage. Living in the San Francisco Bay Area, I’ve experienced some exciting times with the local baseball teams—the Giants winning the World Series being the most memorable highlight. Some of my favorite players include Felix Hernandez, Tim Lincecum, and Cliff Lee among others. 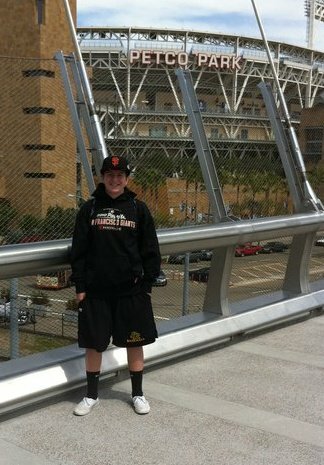 I played baseball up through my freshman year of high school and transitioned into being a full time fan. I regularly attend major and minor league games when I have free time. I enjoy working at a baseball store. I’m in my senior year of high school and hope to major in Journalism or Sports Administration in college. Follow Bernie on Twitter (@BernieOlshansky). Posted on November 15, 2012, in MLB Player Profiles and tagged a, american, awards, baseball, bay, cy, cy young, david, david price, dickey, league, mets, mlb, national, new, price, r, R.A, r.a. dickey, ra, rays, tampa, york, young. Bookmark the permalink. Leave a comment.